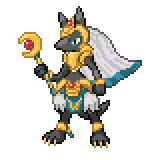 Delta Lucario (referred to as just Lucario in-game) is a dual-type Dark/Ground Delta Pokémon. 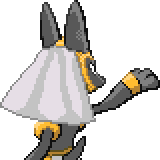 It evolves from Delta Riolu when leveled up with high friendship during the night. 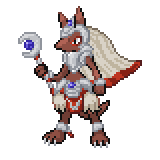 It can Mega Evolve into Mega Delta Lucario using the Delta Lucarionite. 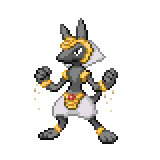 The afterlife and rebirth of souls are sacred to this Pokémon. 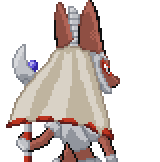 It will fiercely guard any tomb or cemetery that it comes across from graverobbers. A level of "Start" indicates a move that will be known by a Delta Lucario obtained at level 1. This page was last edited on 29 April 2018, at 22:39.